If you’re anything like us you need all the help you can get when it comes to remembering to do, basically, anything. To-do lists and the like help, but you need to remember to look at them, while calendar reminders only pop up at certain times. Memory Helper on the other hand appears whenever you wake up your phone, which we’re probably doing about 3000 times a day. In other words, this app was seemingly built for us, but it could help you too. 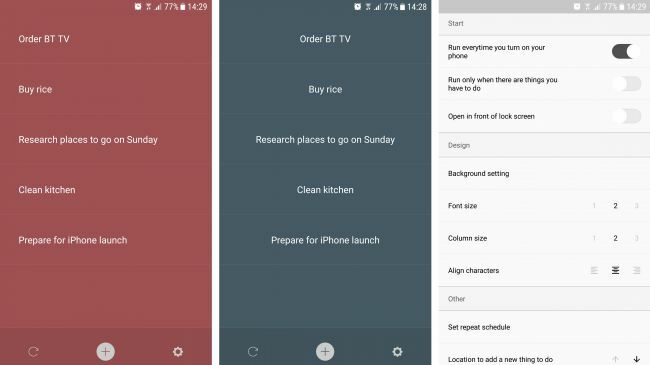 It displays a simple list of tasks or reminders, which you can swipe away once you’ve completed, or tap a button to bring back an accidentally cleared entry. You can customize the colors and layout, set it to only run when you have things in the list or always run, choose whether you want it to pop up before or after your lock screen and a few other helpful functions. Basically Memory Helper is just good at making sure the things you want to remember end up in front of your eyes as often as possible, in a mostly unintrusive way. There is an IAP to remove adverts, but oddly it only claims to remove them for a month, before presumably you have to pay again. This isn’t worth it in our opinion, as the free version is fully featured.